We haven’t had an update from Ed March for a while, probably because he and Rachel have been busy riding madly off in all directions in eastern Canada. But if you live in Moncton, you can get your next update in person, as Ed is giving a talk there on Friday night. In case you’ve missed his CMG columns and his motorcycle show appearances, Ed and riding partner Rachel Lasham are just finishing up their trans-Canadian tour that ran throughout most of the winter – on Honda step-throughs. Mad, you say? Maybe, but Ed’s an old hand at this sort of thing, having ridden from Malaysia to the UK on the same bike, and toured Scandinavia in the winter as well. 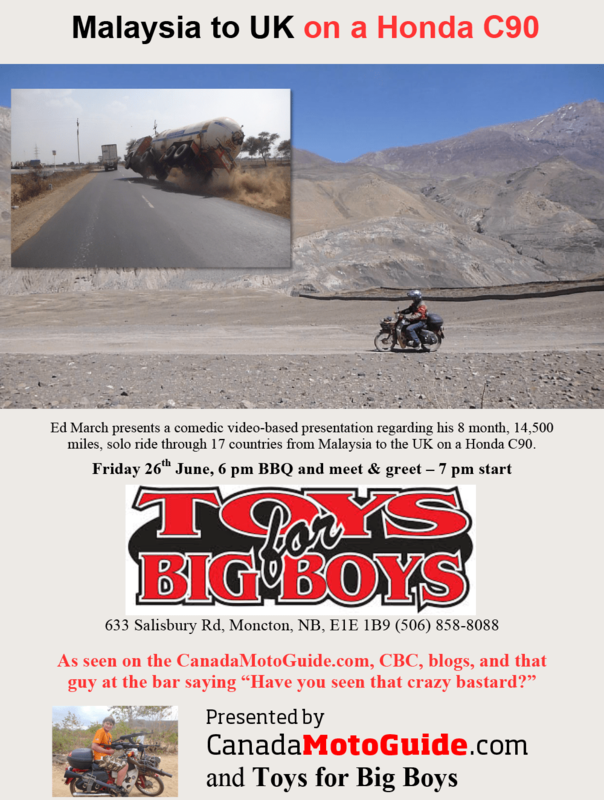 On Friday, Ed will be speaking at Toys for Big Boys, Moncton’s local Honda dealership. Since Ed’s choice of rides is a Honda C90, it’s a perfect fit! There’ll be a BBQ as well and an opportunity to buy Ed’s DVD of his Malaysian adventures (bring cash, buy a DVD and help Ed and Rach get all the way to Argentina!). The event will likely run in the 6-9 PM time slot on June 26, but details might change, so keep your head up – we’ll post any additional information on here, in the meantime, please check in at the event’s Facebook page to let us know if you’re coming so that we can prep accordingly.